An Egyptian monk who was wanted by the government in a land dispute case turned himself in to the authorities on Thursday, a security source told Al-Ahram Arabic website. Monk Boules El-Riyani, whose given name is Maher Aziz Hana, was recently sentenced in absentia to five years in prison after he was convicted of obstruction of government administration and illegal use of state land. El-Riyani along other monks at the Saint Macarius Monastery in Fayoum have been obstructing for months now the building of a road on 13,000 feddans of land that authorities say is crucial for travel in Egypt's Western Desert. The monks, however, insist that they have been living on the land for decades and refuse to surrender it. On Wednesday, the Fayoum governor and officials from the Egyptian Orthodox Church met presidential adviser for national and strategic projects Ibrahim Mahlab to discuss possible ways of ending the dispute. 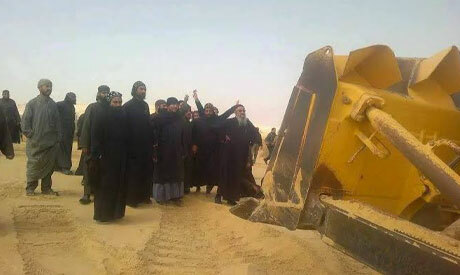 Earlier this week, a group of monks, allegedly led by Boules, attacked engineers from the state-owned Arab Contractors Company who were working on building the road earlier this week, according to Ahram reporter in Fayoum. The Egyptian Orthodox Church, which does not officially recognise the monastery, has been for several months attempting to mediate between the two sides in order to reach a compromise. According to the latest agreement between the state and the church, 3,000 feddans of the disputed land have been allocated for the monastery's use.